What should have been an exciting week for Southwest has turned into a customer-relations disaster. On Tuesday, the day it launched its controversial new Rapid Rewards program, the airline’s operations collapsed into intermittent paralysis. Many customers were unable to log in to their Rapid Rewards accounts online, and those who did often found their accumulated credits wiped out. A separate issue shut down the airline’s phone services, leaving frustrated customers on hold for extended periods and preventing airport employees from swiping boarding passes. Flights were delayed, lines were long—it was an unqualified mess. Our first issue came yesterday morning when we flipped the switch for our All-New Rapid Rewards program. 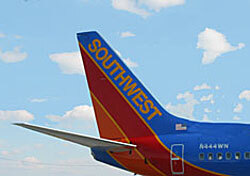 Throughout the day, southwest.com had intermittent issues regarding functionality and accessibility. We had a Command Center in place and our folks were ready to immediately spring into action to address and fix the “bugs” as they were discovered. … As Murphy and his law would have it, in a completely unrelated event yesterday evening, our primary telecommunications provider experienced an outage that affected the network connectivity at some of our airports and call centers nationwide. This resulted in long lines of Customers at many airports. That’s what you call a no good, very bad day. Of course, this all comes on the same day Southwest launched what has so far been a coolly received revamp of Rapid Rewards. Industry observers, like our own Tim Winship, gave the program positive reviews, but Southwest loyalists have been divided. Breaking the website on day one of launch isn’t likely to build support. And the problems have dragged on into today, apparently. Southwest’s Facebook page is full of post after post from customers complaining about long wait times on the phone or the new Rapid Rewards or both. Responses from Southwest are few and far between. Southwest has posted an FAQ for customers encountering unexpected changes to their Rapid Rewards account. That said, this sort of stuff happens. When JetBlue switched to a new reservations system last January, the site had to be shut down for 24 hours, and was hampered by persistent issues when it relaunched. And as someone who knows how finicky websites can be, I have more than a little sympathy for the airline. You can test a new product all you want, but until it goes live, you can only be 99 percent certain it will work exactly as designed. As we’re seeing with Southwest, that 1 percent can be a real bugger, especially when your vaunted customer-relations team seems MIA. Readers, have you had issues with your Rapid Rewards account, or with southwest.com?